About a year or two ago, my husband and I caught sight of a unique delivery menu tangled between the myriad pizza and chinese trifolds that litter our front steps each day. Taqueria Los Jalapenos was a Mexican delivery place at 4th and Moore. South Philadelphia is teeming with Mexican taquerias yet we were moved by the affordable menu and their willingness to deliver. And the kicker–they even took credit cards! Score! We checked it out for the first time with my family and shortly after we hung up the phone, our hot food was at the door. I don’t quite remember what everyone got, but highlights were definitely the chicken and rice soup in a creamy tomato broth and my sister’s carne asada. Since that fateful night, my husband and I have been ordering from Los Jalapenos almost weekly. We love the friendly service (no joke, every time I hang up the phone I say to my husband “they’re so nice,”) speedy delivery and, more than anything, their hearty and flavorful fare. A few weeks ago, my husband sent me an article with a note “this is terrible.” We learned that Los Jalapenos would be closing so the owner could focus on his new restaurant, Three Jalapenos, that recently opened at 8th and Christian. Tragic news! We had to get our last few orders in before they closed at the end of February (according to the article.) On Friday, I called in an order and things seemed a little different. The man answering the phone had trouble hearing me due to lots of metallic banging sounds in the background. When he finally got my order down, I asked him when they would be closing and he responded “well, we were supposed to close today but now we’re closing Monday.” HUH?! First of all, who pushes back a closing? Isn’t it openings that don’t happen on time? More importantly, we thought we had much more time with our beloved Los Jalapenos. Whatever would we do?!? Luckily we ordered a truckload of food that would make for a memorable last meal. The food came quickly, as usual, and we gave our delivery man a healthy tip in honor of our farewell meal. This was our closing order: A steak, pepper and onion burrito with guacamole, hold the rice; crispy ground beef tacos, chicken rice soup and El Mojado (two crispy tacos, one guacamole tostada, one cheese enchilada and a side of rice and beans.) 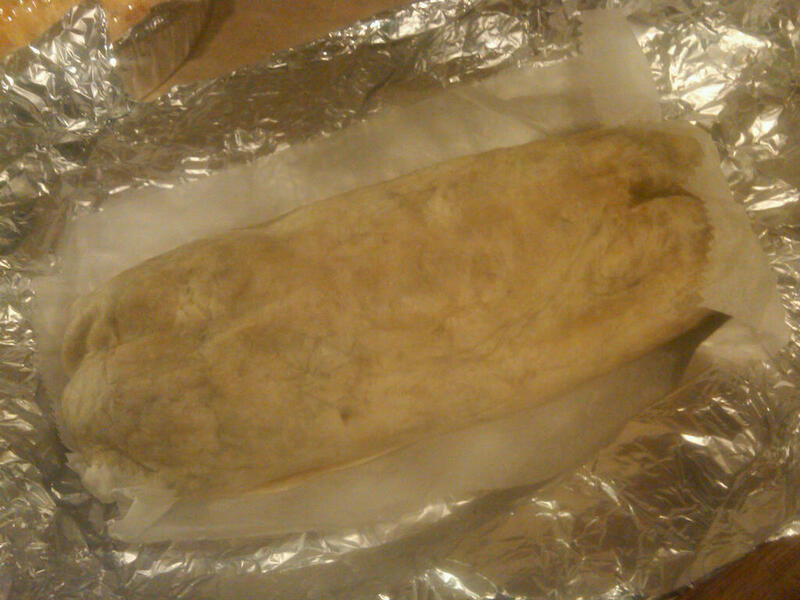 The burrito was large and in charge, as usual. 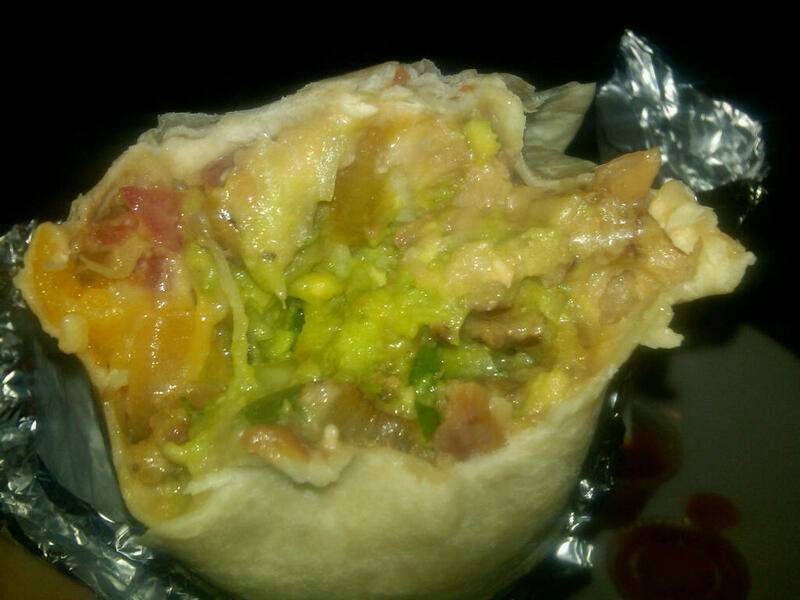 It was chock full of meaty, cheesy, beany, guacamole-y goodness. We usually share the crispy tacos as an appetizer. Simple, yet tasty. I love a well-made crispy taco with a perfect balance of filling and CRUNCH. If our dog is extra lucky, she’ll get to lick the container of extras that fell out of the tacos. 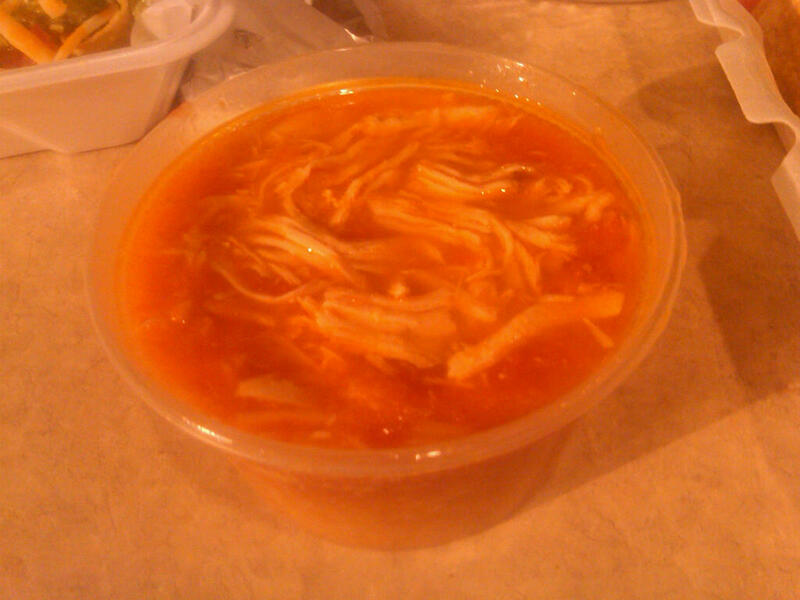 The chicken rice soup never skimps on fresh, shredded chicken breast with a rich tomato broth. It comes with a side of corn tortillas for dipping. Ouch, that picture is really, really bad. 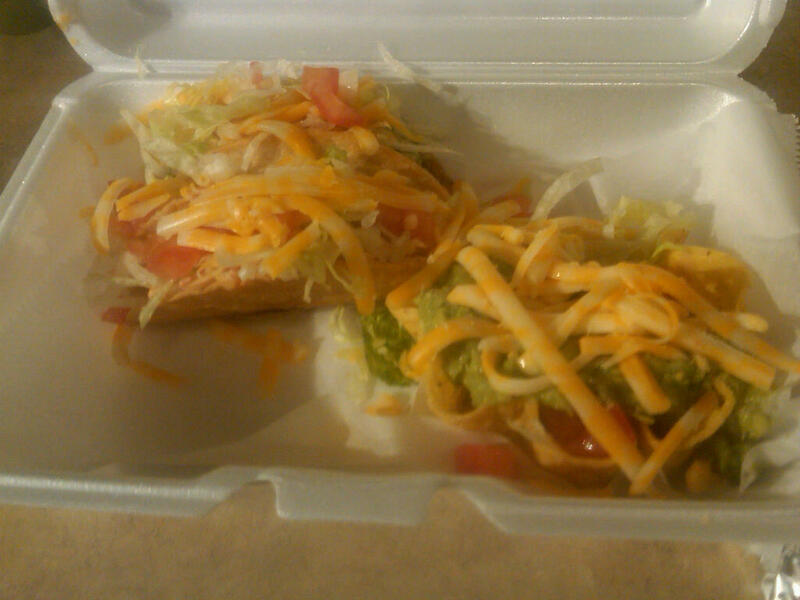 That tostada is awesome–lots and lots of guacamole contained in a crispy tortilla cup. 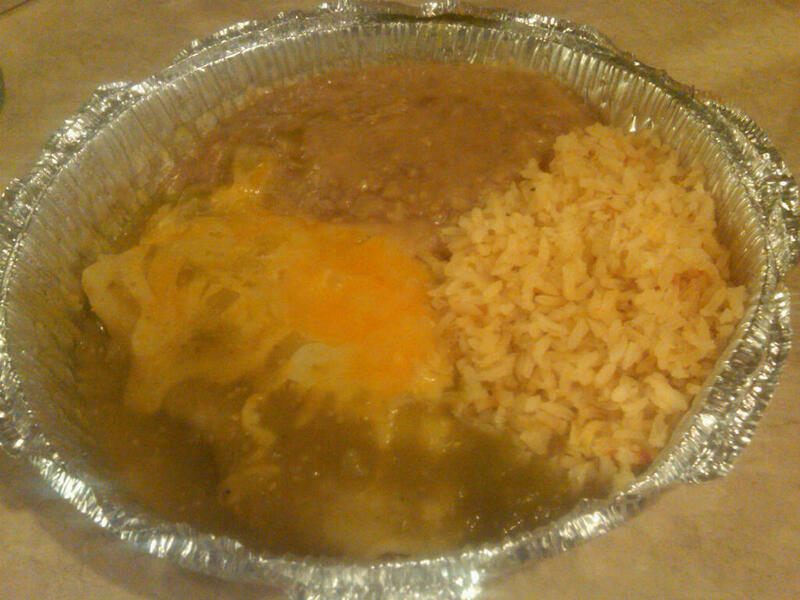 The next container has a cheese enchilada with a side of rice and beans. My husband usually saves that for leftovers the next day. My favorite way to eat this is to get a little bit of everything in one bite. The creamy beans are a personal favorite. 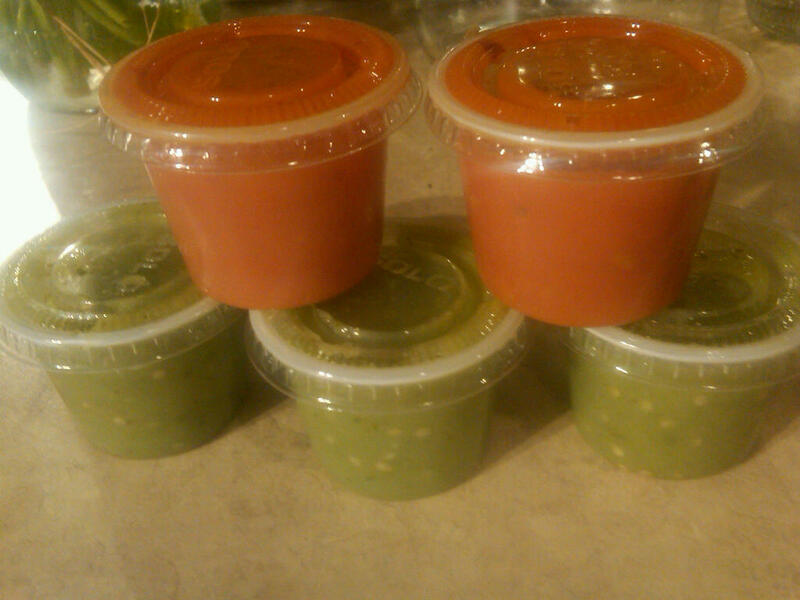 I couldn’t write a post on Los Jalapenos without discussing their salsas. Our refrigerator is littered with leftovers of these little packets. The green tomatillo is usually a little smoother and fresh tasting while the red salsa has a great smoky kick. We have a love-hate relationship with these sauces as they seem to be slowly taking over our fridge but they’re just so darn good. Unfortunately, as quickly as our food was delivered, the dinner came to an end. Goodbye, dear Los Jalapenos (or Three Jalas, as we so affectionately call it,) we will miss you on our Friday movie and Mexican nights. 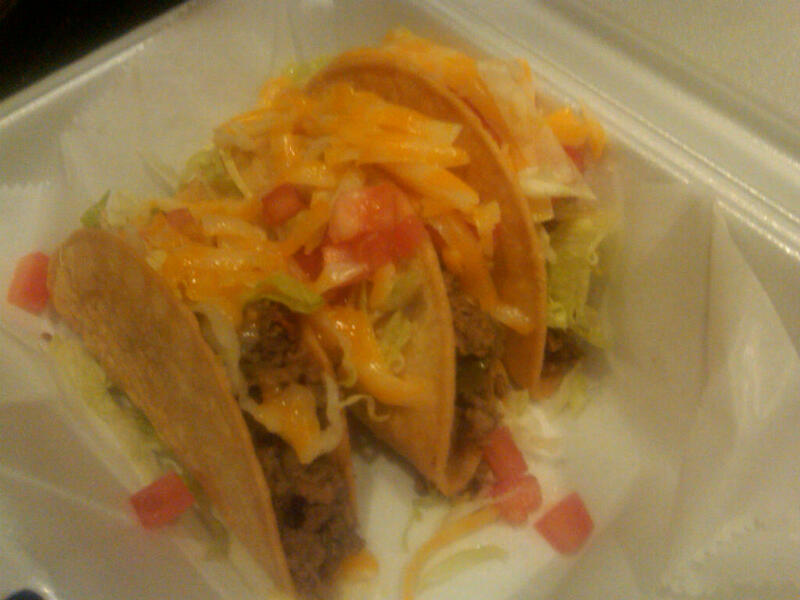 Guess we’ll be seeing you at your new location’s Taco Tuesday–$11.95 for All-You-Can-Eat tacos. While our relationship was too short, we’ll never forget you.